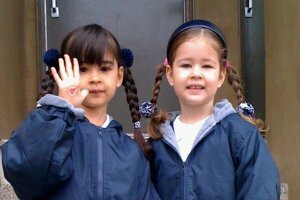 Tips for the First Day of Kindergarten! Bring your camera for the first week or two and take photos of the other kids too. When your child comes home and says he or she made a new friend (or something happened with someone), you can go through the photos to identify the child. When my kids graduated, I printed all the photos of other kids through the years and they gave them as “graduation/memory” gifts to their friends/classmates. You a get some additional photos of the start of school without making too much of big deal out of your child going to school when you’re casually taking photos of other kids or the school in general. (Note: DO NOT POST photos of other people’s children to social media or share online without their permission. Take a picture of your class list. Many schools post the class lists on a board so everyone can know where to take their kids. We take a picture for reference because it so hard to remember all the kids’ names with all the excitement of the first week. Show your child where you will meet them after school. It’s not just about drop off. Play “what if” game. What if I am late picking you up?” “What if you can’t find your jacket?” Mix these in with fun “What if’s” (For example: What if you were a bird? … could eat all the ice cream you wanted? … had a special power? etc. Make sure your child knows how to open and close lunch containers, including: ziplock bags, lunch bags, put straw in the juice box (without squeezing all the juice out) AND know how to close containers. Left over yogurt spilling out all over the lunch bag is no fun. 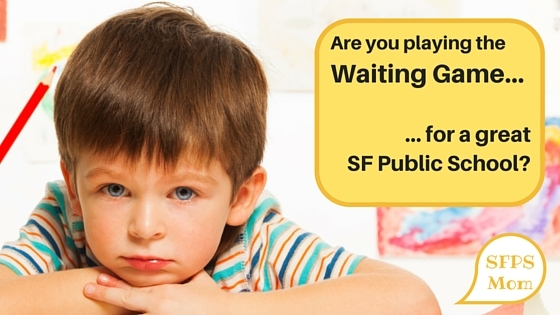 If it’s kindergarten or Transitional Kindergarten (TK), schedule a light work day. You may be emotional and hard to focus on work. Have clothes picked out the night before to avoid major decision making the morning. If you don’t have morning kids, dress them while they’re sleeping in bed as you’re trying to wake them up. If your child brings his or her lunch, make the main part of their lunch and let them pick the fruit, drink, or other additional food. This gets them involved and will be more likely to eat their lunch. Be prepared if your child is totally exhausted the first few weeks/months (and goes to be at 6pm.) … or cries. It’s natural. School is tiring, especially if there are after school activities. I’ve heard that some kids took up to 3 months to adjust. Be prepared for the stack of paperwork coming home. And, it. Will. Come. Get yourself a 3-ring binder and 3-hole punch sheet protectors (on sale at any office story.) Put the empty sheet protectors in the binder. Put the binder on an easy-to-access shelf. Now whenever the inevitable “You were a star in class today!” or “Best Tuesday question-asker” awards come home, slip them into a sheet protector. Ditto with extra special homework assignments. Then throw everything else you don’t need out. (fold when necessary) At the end of the year you’ll have a nice, easy to flip through record of the year—instead of stacks of papers you’ll never really go through and will eventually throw away. Label EVERYTHING. It’s amazing how many jackets, lunch bags, etc. wind up in the lost and found. Note: be careful about putting kids’ first names on anything, especially if it can been visible from afar. I used first initial and last name, for safety reasons. — we don’t need strangers knowing our kids’ names. If you’re driving to school, plan an extra 10-15 minutes the first day (or the first week). 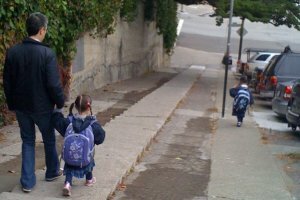 Everyone drives their kids the first day, parks, and walks their kids to school. So be ready to park a few blocks away and walk. Plus, if you timed the driving during the summer, there’s more traffic congestion when school starts. If you haven’t done so, make sure your child knows how to go the bathroom by him/herself. One good exercise is to go to a public location (restaurant, library) and tell your child to go in and you’ll wait outside. Prepare a note to the teacher to inform him or her of any special needs. Examples include: major allergies or fears, etc. Join the Parent Teacher Association (PTA) or Parent Teacher Organization (PTO). Don’t make them harass you. Just Do It. 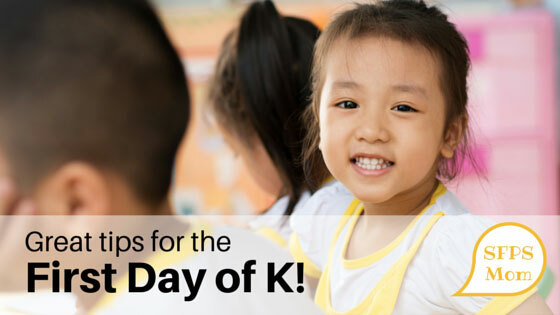 Do you have any tips or ideas for Kindergarten parents on the First Day of K? Please share them below!